Amino acids are added sequentially to a growing protein chain, allowing a mature protein to be created. As discussed previously, DNA is not directly involved in the operational output of the cell. Instead, genes transmit a message through mRNA, that can then be decoded by the protein synthesis machinery, to create a new amino-acid chain. The two processes this depends on are called transcription and translation. Transcription is the name of the process during which messenger RNA (mRNA) is transcribed from the DNA sequence. The word ‘transcribed’ is used, because DNA and RNA use almost the same ‘language’ – nucleotides. Thus, the information can be copied from one nucleic acid to another. The transcribed molecule is called messenger RNA, as it carries the message contained within the DNA to the protein synthesis machinery. Translation is the name of the process through which the mRNA directs the production of a polypeptide chain (protein). It occurs in the ribosome. The process is termed translation because the languages used are different. Accordingly, the information contained within the mRNA must be translated into the sequence used by amino acids. Transcription is a tightly regulated process, and patterns of transcription depend on the needs of a particular cell at a point in time. Transcription is the process by which a DNA sequence is copied into an mRNA transcript. The main enzyme involves in transcription is called RNA polymerase. RNA polymerase uses one strand of the DNA template to make a complementary strand of mRNA. Transcription begins at a site just next to the gene called the promoter. Every gene has its own promoter, so that genes can be transcribed independently of each other, depending on the needs of the cell at a given time. The promoter is where RNA polymerase binds, to begin synthesising the mRNA transcript from the DNA template. 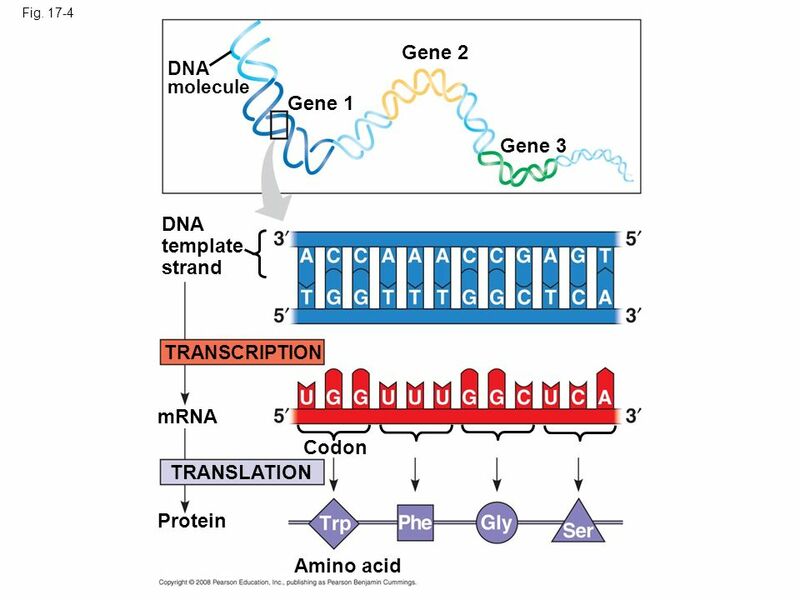 Transcription can be divided into three steps: initiation, elongation and termination. Initiation starts with the binding of RNA polymerase to the gene promoter, where it separates the two DNA strands to generate a single stranded template. This process creates a region of open DNA called the transcription bubble. During elongation, the template strand is read by the RNA polymerase, which creates a complementary RNA molecule a it proceeds along the template. Behind the RNA polymerase, when a particular sequence has finished being transcribed, the double helix reforms. The final stage, termination, relies on the presence of terminator sequences that are present in the DNA. These signal to the RNA polymerase that the gene sequence is complete, releasing the new mRNA from the enzyme. Some additional processing of the mRNA is required before it becomes a mature mRNA, potentially including a process called splicing – which removes sequences that have not to make the final protein. We now know how DNA transmits information into an RNA to become transcribed, but how does the next step occur? How does the mRNA translate into an amino acid? A complication here is that there are 4 bases, but 20 possible amino acids, so it cannot be a one letter to one amino acid translation. To explain this, triplet units of bases specify one amino acid. These triplets are called codons. For example, the triplet sequence GCC specifies that the amino acid alanine should be added next in the amino acid sequence. In summary, the mRNA sequence is composed of a series of non-overlapping 3 letter words, which are decoded to different amino acids. Following transcription, the mature mRNA moves from the nucleus to the cytoplasm where it will find the ribosomes to begin translation. 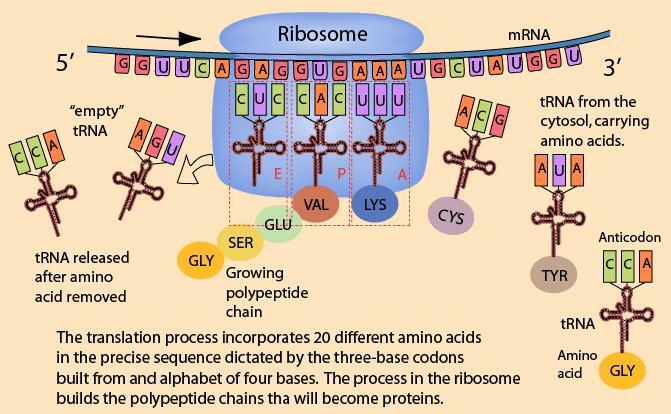 Translation starts when the mRNA binds to the ribosome. Each amino acid is brought to the machinery by a specific transfer RNA (tRNA) which act as interpreters of the mRNA strand. The type of amino acid brought to the mRNA depends on the anticodon sequence present on the tRNA. The anticodon sequences present on the tRNA are complementary to codon sequences on the mRNA. Anticodon sequences also correspond to a specific amino acid. When base pairing takes place between the codon of the mRNA and anticodon of the tRNA, adjacent amino acids (attached to the opposite sides of the tRNA) form peptide bonds. This process of base pairing ensures that the correct protein is synthesised based on the sequence information in the mRNA. The machinery progressively slides down the mRNA codons, extending the amino acid sequence. This process occurs until a special codon called a stop codon is reached when the complex knows to terminate translation. Through this process, the genetic message conveyed by the mRNA is translated, with tRNAs recognising the code and delivering the correct amino acid, and the ribosome linking all the amino acids together sequentially. This is simple in principle, but is a hugely intricate process in a eukaryotic cell requiring the interplay between various complexes.